The “reindeer crew” of Season 84 will not be pulling Santa’s sleigh until late October this year. But don’t worry. With the “ber” month already creeping in, the San Sebastian Stags are just making sure no lion cuddler, bomber jet or knight lancer gets stuck in the championship loot bag of its title-anticipating faithful. Pardon them for playing selfish elves; they just want to make sure there won’t be another NCAA basketball winter on Recto avenue. Yet despite the Stags’ imposing 14-and-0 win-loss card, that Baste-induced confetti shower of an early X-mas wish remains expendable. Call it the Grinch effect. And so let us count the four, err, Grinchy ways to beat NCAA leader San Sebastian and stain their unblemished record thus far in Season 85. 1. 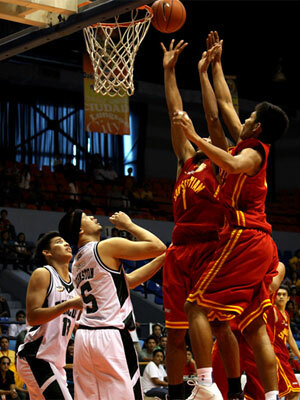 No gift shots for Jimbo Aquino and Gilbert Bulawan. Sending Baste’s 1-2 punch to the stripe 10 times or so is like willfully yielding precious bucks to a cabal of thugs. Fact is Aquino and Bulawan, the guys who shoulder nearly half of the Stag’s offensive load, are making a killing from the freethrow line, shooting 79 and 85 percent respectively. For starters, the beauty of the freethrow is best captured by the “luxury” of stroking the ball to the hoop sans the fuss of avoiding a pesky hand clawing one’s face. It also allows the offended party to catch his breath while earning badger-free scoring opportunities. Given the Aquino-Bulawan tandem’s near murderous exploits on the foul line are triggered by their aggressive play, policing them in real-time action (i.e. compelling them to negotiate the defense) is much better than cuffing their hands in a blissful 20 seconds of unmolested shooting drill. 2. Do a “Hack-a-Shaq” on Baste’s bigs. It’s no secret that the Stags’ under-the-bucket duo of Calvin Abueva and Ian Sangalang are more comfortable leaning over their defenders in the paint for easy put-backs and bank shots than reciting the flunker’s prayer on the charity pew. Abueva and Sangalang are San Sebastian’s foul-line zombies, tallying nightmarish averages of 57.9 and 52.9 percent, respectively. But exhuming Baste’s bigs from their comfort zones would require hard-nosed hackers who can also limit their rebounding touches by boxing them out to kingdom come.